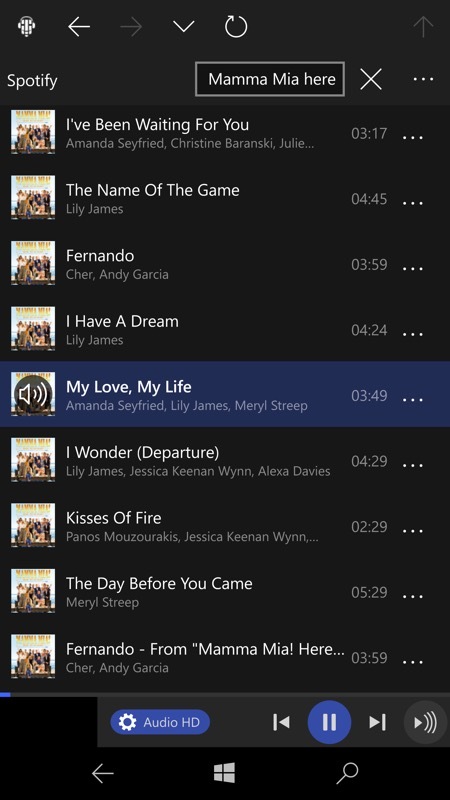 Spotify is one of those huge applications for other mobile platforms that never quite made it to Windows 10 Mobile as a fully fledged UWP app (the PC version is Win32 etc. ), but the third party Spoticast UWP works so well that for some people they might never notice the difference. 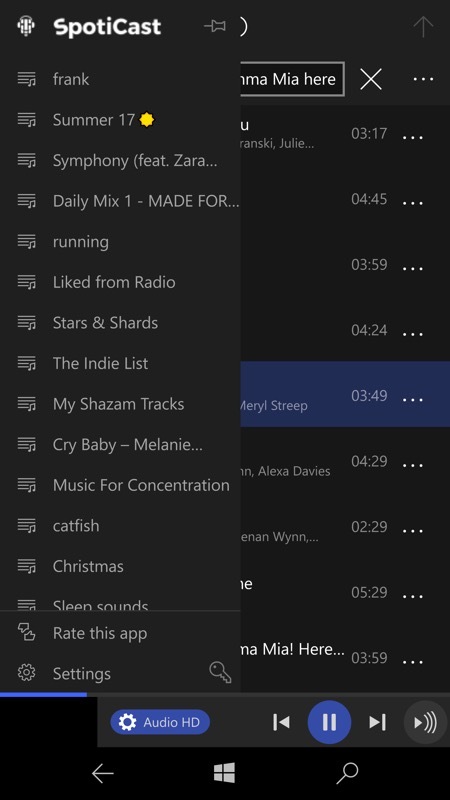 Admittedly it's a hack of sorts, pulling all the music needed from YouTube behind the scenes, but the front end is all genuine Spotify, with your playlists and radios. 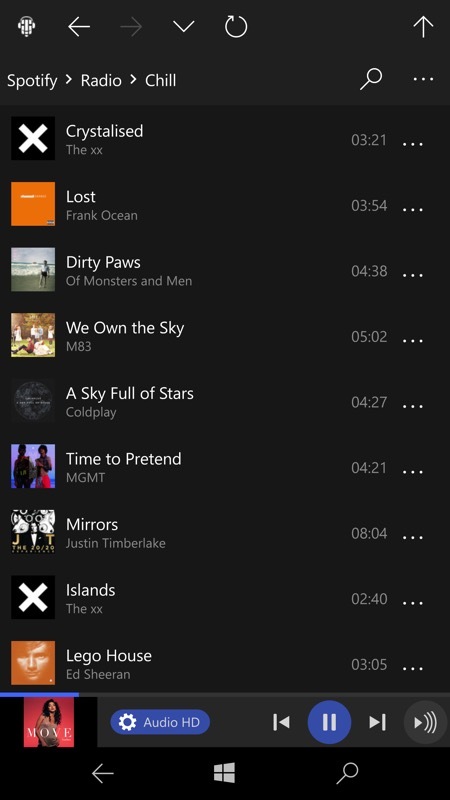 The gotcha that arises from music being sourced from YouTube rather than Spotify directly is that there's a five second (typically) pause between songs, while the next track is found online and the right stream started. If this is a showstopper for you then you're screwed. But for general background enjoyment, Spoticast is really, really impressive. 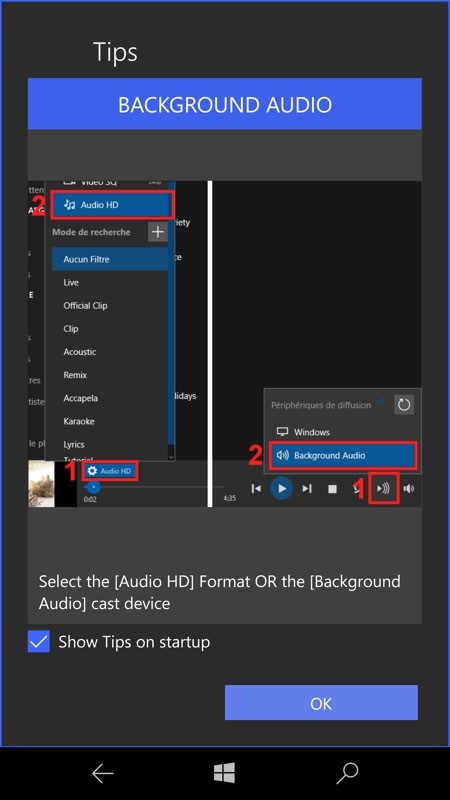 Working my way through one of the Spotify playlists, with just slight pauses between tracks while the right YouTube streams are accessed; (right) Spoticast's long, long hamburger menu is used for both Spotify navigation and application sections. 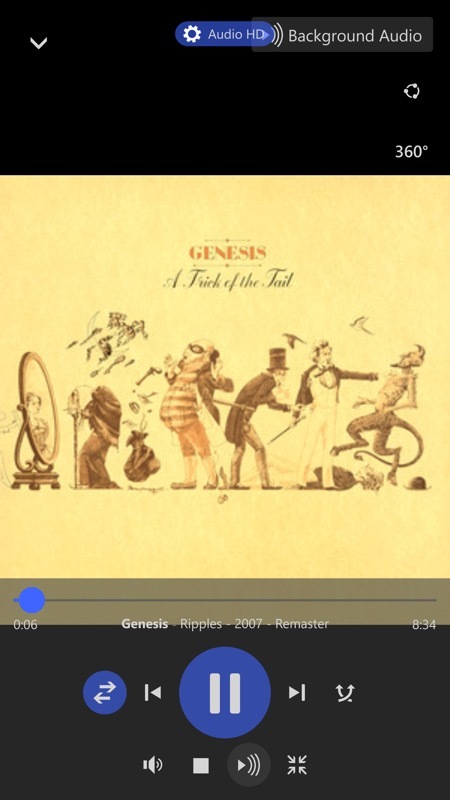 Note the 'now playing' controls at the bottom, playback continues while you hunt for other things. 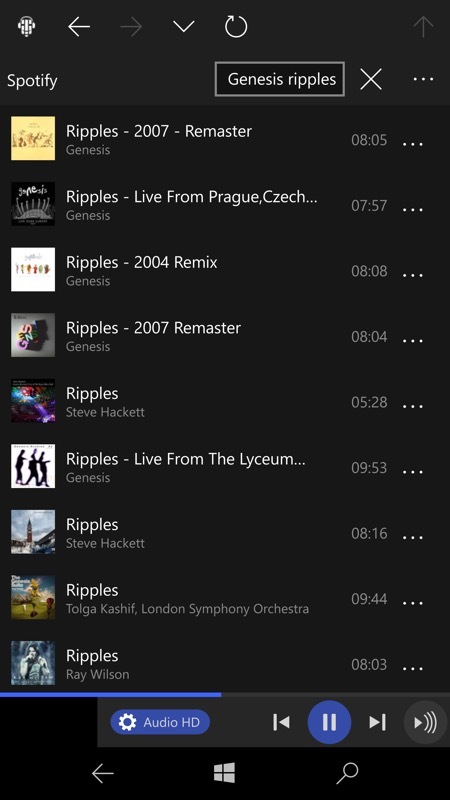 Inside one of Spotify's 'Radio' streams; (right) looking for specific songs is easy and quick - a quick way to get to music for free, once you've bought Spoticast itself. Yes, YouTube itself is free, but this has no adverts and can be set to 'audio only', saving hassle and bandwidth. 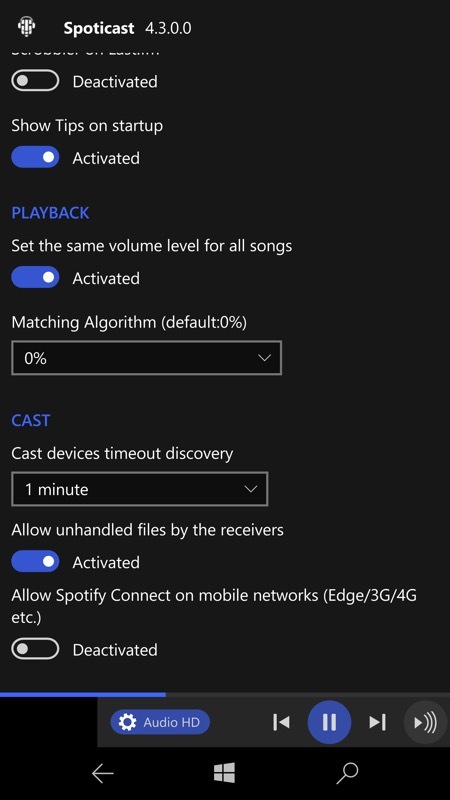 Browsing some homegrown Spotify playlists; (right) some of the advanced Spoticast settings, including restricting playback while on cellular data. Searching for a classic 'prog' song, as an example. Spoticast surfaces loads of versions and they're all just a tap away. All very cool. 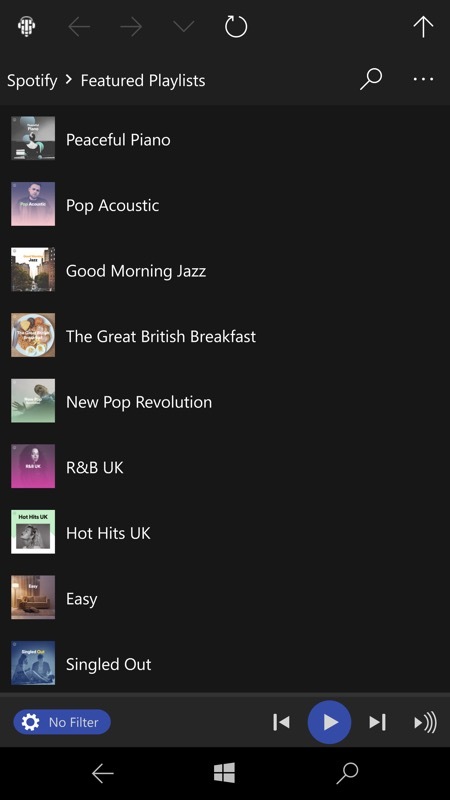 You can buy Spoticast UWP for Spotify here in the Store - and there's a 24 hour free trial if you're not sure etc. 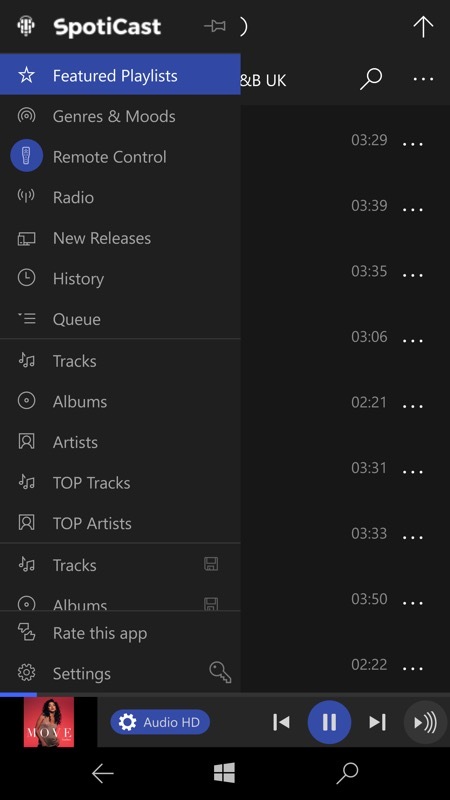 Comments welcome if you use this - how do you find it and how close is it to a first party Spotify client?